Dust Studio is very proud to announce that all our model kits from the Deluxe Edition range and the Dust-48 range are now provided with their own gaming stat card for Dust Tactics! All the rules to play our models kits can be found in Dust Tactics' expansions, mostly Operation Cerberus and on Dust Model website, on each model kit's page. There you will find the description of the unique skills these models can have. 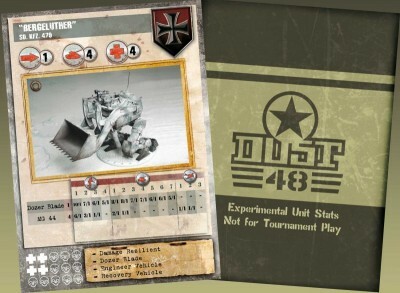 All other skills and game rules are within Dust Tactics' booklets. As many of these new models introduce very new game rules, the cards don't have an Army Point Cost attached: therefore these models are not “legal” to play in Dust Tactics tournaments. But you can surely enjoy them when playing with your friends! All these new stat cards can be ordered from our web store at www.dust-models.com. If you bought some of our earlier models kits, you'll certainly want them. To keep things simple we've made a pack with all the cards from our earlier models and priced it at 3.99 US$. Quite a bargain! Happy gaming, Dust Studio Team.